Café Valet takes pride in providing our customers with a great-tasting cup of freshly brewed coffee. That cup is prepared in just minutes and exactly as desired. Every time. 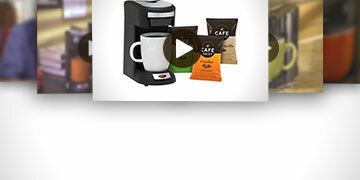 We may not be a household name like Keurig just yet, but we know more than a little bit about single-serve coffee. We’ve been serving the U.S. hotel industry and their customers single-serve coffee since 2003. We've been supplying the hospitality industry with great-tasting coffee for over 60 years! In fact, Café Valet served up more than 100 million cups of great-tasting coffee in 2014 alone. Now we’re ready to bring our expertise to you! And what exactly makes us so special? We’re glad you asked! 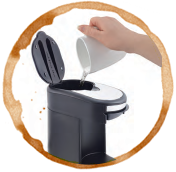 We offer the best overall value in single-serve coffee brewers, period. Our brewers start at just $16.99 and in some cases offer a savings of over $100 versus that of other brands. Our system saves you money by using less power and water than our competitors. 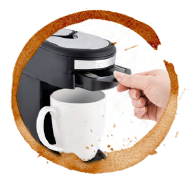 Our Signature Brewer is made for modern tastes, offering a compact footprint measuring just 4.5”W x 8.5”H x 8.5”D. Only five steps are required for that great-tasting cup of coffee. Our brewers create the ideal brewing conditions for great-tasting coffee. 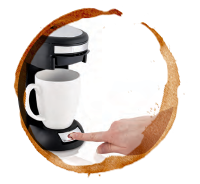 Enjoying a great-tasting cup of coffee in a few minutes is only part of the convenience Café Valet consumers enjoy. 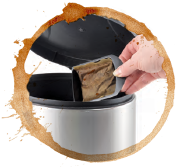 They also love our disposable tray that you simply toss in the trash after brewing; nothing to clean up is an extra bonus. Our brewers feature low power consumption, only drawing 500 watts of power when brewing and none while idiling. We think that tells a nice story, but there’s more! Our Café Valet Dark Roasted coffees are a gourmet blend of Rainforest Alliance Certified™ and 100% Arabica coffee delivering exceptional taste to passionate coffee drinkers like you. Café Valet coffee is available in Dark Roast, Dark Roast Decaf and French Vanilla. Each pack of Café Valet coffee is nitrogen flushed to ensure long lasting freshness and a consistently delicious cup of coffee. The whole concept can be boiled down to our mantra…One Cup, One Pouch, One Button. Perfect coffee, every time. The big payoff? 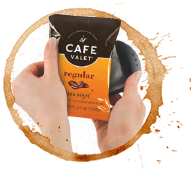 Using the Café Valet Single-Serve Coffee System means you'll enjoy those all-important coffee experiences even more. There’s no hassle, no waste and no clean up, just more time to savor the flavor and aroma you've come to expect and appreciate.